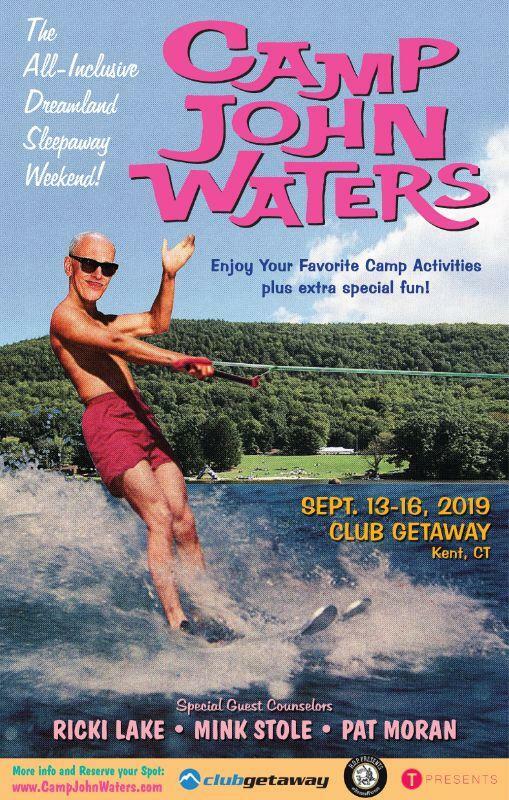 John Waters (Pink Flamingos, Hairspray, A Dirty Shame) will host the most exclusive Sleepaway-Camp experience for fans in Kent, Connecticut September 13-16, 2019. Adult Summer Camp, Club Getaway, will be transformed into Camp John Waters for this truly unique weekend experience. John Waters Costume Contest – Judged by John Waters himself! We've taken your feedback on our last two summer camps into consideration and are working tirelessly to bring you what is sure to be an even dirtier, filthier, raunchier weekend than you could have ever hoped for! Location: Located in the Berkshire Mountains of Kent, CT, Club Getaway is just 90 minutes from New York by car or Getaway bus. You’ve got all weekend to enjoy our best sports and adventures as well as our Special John Waters Activities and Events. What’s Included: At Club Getaway we take care of everything! All accommodations, all meals including wine with dinner, all sports and activities and evening entertainment is included. The only additional cost is for any beverages purchased . Different beverage packages are available for purchase. Accommodations: Staying in the great outdoors doesn’t mean roughing it! Guests stay in comfortable rustic chic country cabins overlooking our beautiful lake and mountains. Think heat or air conditioning, private bathrooms and even daily housekeeping. All linens are included. Our cabins have 2, 4 or 6 twin beds with plush memory foam mattresses! Fill a cabin with friends to guarantee SAME GENDER CABINS or come by yourself and share a room with men and women who LOVE JOHN WATERS! Dining: Let us wake up your taste buds with delicious cuisine prepared at the club by our very own chefs. Our guests rave about the food, and you will quickly taste why! Our breakfast buffet is like none you have ever seen. Lunch is an activity within itself – salads, sandwiches, carving stations, pasta, tacos, pizza, BBQ, sea food – the list goes on, and we haven’t even gotten to dessert! Dinners are special occasions, where conversation flows freely. We offer gourmet dishes and vegetarian and vegan options. And should you crave an afternoon snack, join us down by the lake when we fire up the grill.